Red Ribbon Week in elementary school is always a challenge. Some admin and parents don't want their kids introduced to concepts too early. We've all had that "What are drugs?" awkward conversation with a kiddo. Also, some schools like to take an approach of promoting healthy choices rather than saying no to drugs. There are several wonderful resources for Red Ribbon Week like the Natural High videos, but again these aren't perfect for an elementary audience. 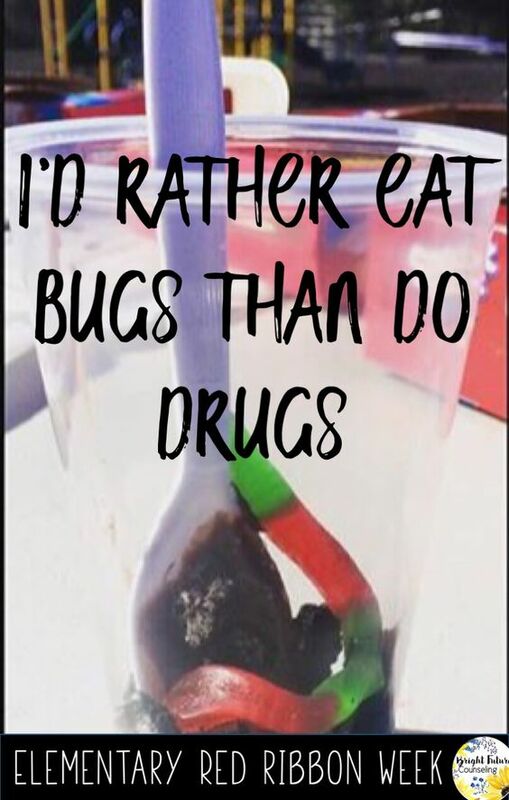 I wanted a quick way to introduce my students to RRW so I created a fun recess activity with the theme "I'd rather eat bugs than do drugs!" Who doesn't love snacks and photo booths? - Buying all of these treats can be expensive! Check with your principal or parent teacher committee to see if there are funds available. I was reimbursed for my purchases. It doesn't hurt to ask! - Run it by your admin. Mine thought it was a great idea but a few of the teachers didn't like the idea of candy. And of course you always want to check on allergies. Have a great Red Ribbon Week! What activities does your school do?